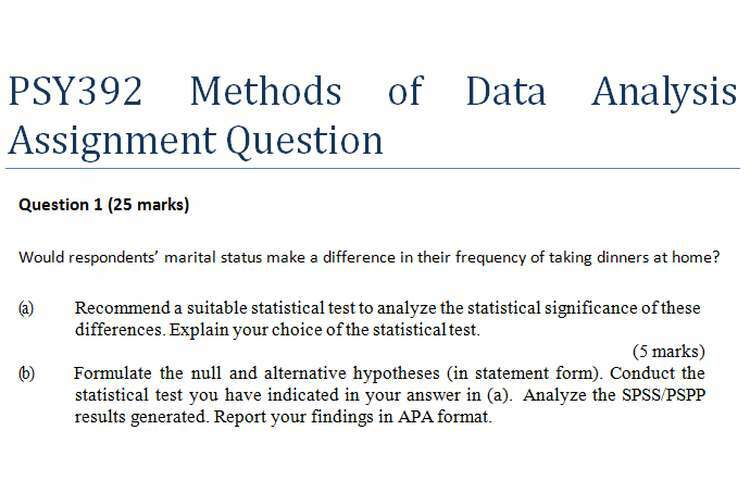 For this PSY392 methods of data analysis assignment question, you will be using the same dataset that you have worked on in your TMA01 (Data from the survey on the food consumption behavior among Singaporeans) to run the relevant SPSS/PSPP commands, to generate the desired output for analysis and interpretation. Would respondents’ marital status make a difference in their frequency of taking dinners at home? (a) Recommend a suitable statistical test to analyze the statistical significance of these differences. Explain your choice of the statistical test. (b) Formulate the null and alternative hypotheses (in statement form). Conduct the statistical test you have indicated in your answer in (a). Analyze the SPSS/PSPP results generated. Report your findings in APA format. (c) Interpret the results of the following post-hoc output and report your analysis in APA format. The researcher is interested to find out whether male respondents eat dinners outside home more frequently than female respondents per week. (a) Apply a suitable statistical test to determine if the gender differences are significant or not. To do so, you have to formulate the null and alternative hypotheses (in statement form) and analyze the SPSS/PSPP results, including the descriptive statistics that you have generated. Report your analysis in APA format. (b) Apply the formulae given below to calculate the effect size and interpret this value in terms of its magnitude in the above test. Round your answers to 2 decimal places and show your calculations clearly. (c) In case your conclusion in the above hypothesis test turns out to be wrong, examine the type of error that you are likely to have committed. Briefly explain the circumstances under which this error may occur. (b) The researcher is interested to find out whether there are any significant differences in the choice of favorite ethnic food among male and female respondents among respondents who eat their respective ethnic food every day. Formulate the null and alternative hypotheses (in statement form). Conduct the appropriate statistical analytics and include the SPSS/PSPP-generated output in your answer. Interpret the results generated in your SPSS/PSPP output and report your findings in APA format. (c) Examine the reliability of your hypothesis test based on the SPSS/PSPP results generated in (b). Explain your answer. (a) The researcher is interested to find out whether there is a relationship between respondents’ income and their frequency of eating dinners outside home. Using SPSS/PSPP, conduct the appropriate statistical test and report your findings in APA format. Remember to include the null and alternative hypotheses (in statement form) in your answer. (b) Using the SPSS/PSPP program, build a linear regression model to analyze the extent to which the frequency of eating dinners outside home can be predicted by the gross monthly income of respondents. Formulate the null and alternative hypotheses (in statement form) and examine and explain the coefficient of determination in the PSPP/SPSS output. Analyse the results of the regression model and report your findings in APA format. Formulate the linear regression equation based on the SPSS/PSPP output. If Mr Tan’s gross monthly income is $3840 per month, apply the regression equation in (i) to predict the frequency that he would eat dinners outside home, be it at food centers and/or restaurants per week. Show your calculations clearly and round your answer to 2 decimal places.